Creating and managing coupons shouldn’t be a difficult task for online stores. That’s exactly what WooCommerce offers you by integrating a coupon section within it. WooCommerce coupons is a simple way to generate coupons in your store once you get familiar with its setup and configuration. This article will help you learn about creating WooCommerce coupons, how they work, what are their limitations, ways to get past those limitations, etc. Creating coupons with WooCommerce can be done by going through 6 simple steps. An outline of the steps required to create coupons is as given below. For a detailed explanation of each of the below steps read the article ” How to set up coupons in WooCommerce“. 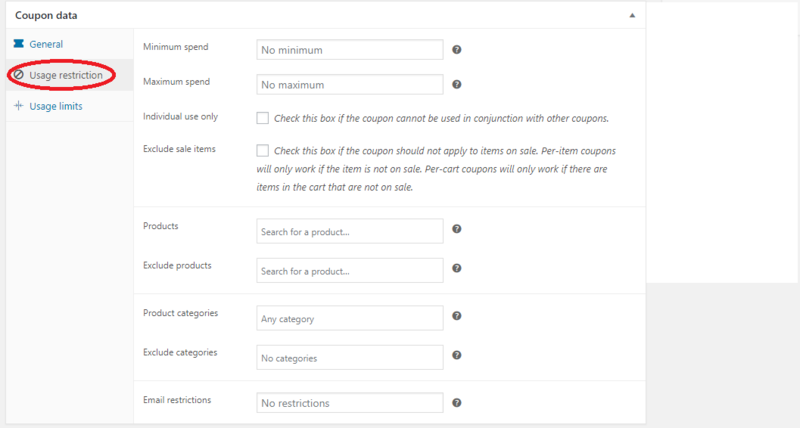 Step 3 – Give general coupon data such as discount type, coupon amount, coupon expiry date, shipping, etc. Step 4 – Give usage restriction for the coupon created. Step 5 – Add usage limit for the coupon. Step 6 – Now you may publish your coupon for making it available to your customers. How does WooCommerce Coupons Work? WooCommerce coupons system let you create a variety of coupons to attract customers to your online store. You can generate fixed cart discount, percentage discount, and fixed product discount coupons with WooCommerce. If you are using certain subscriptions plugins there will be more options of coupons. Fixed cart coupon is for allowing discounts to the customer’s cart. On applying this coupon you will be able to give a deduction on the total amount of your customer’s cart. If one of your customer’s cart costs $60, then on applying a $15 discount coupon, the total cost of the cart will get reduced to $ 45. Percentage discount coupon applies to cart as well, but the discount will only be applied in percentage terms. Say your store generates percentage coupons offering 20% discount on cart items. By applying this coupon on a cart’s price, a $75 cart will only cost $60 for the customer. These coupons persuade your customers to make bulk purchases from your store since they do not want to miss the opportunity to get a discount on the total cart price. You can make the most out of these coupons by strictly allowing and denying the presence of some products in the cart for the coupon to work. This will give you great control over your store’s coupons. Fixed product coupons apply only to individual products. On applying this coupon, the cart total will display an amount after deducting coupon’s amount from the single product’s total. Although WooCommerce coupons help your store in setting up coupons within it in a simple way, its coupon system is in a very basic form without much-advanced features for creating attractive coupons. It can adversely affect your store’s sales and thereby its growth since coupons are one of the popular methods for boosting sales. The major limitation of WooCommerce coupons is that it only lets you create generic coupons from your store, which might fail to attract visitors to your store. Besides that, since WooCommerce coupons can’t be automatically applied, customers will have to enter the coupon code in the required field in order to apply it. This might result in some of the customers even forgetting to apply the coupon. Creating coupons based on customer role is a great way to manage and attract customers to your store. But, unfortunately, WooCommerce coupons don’t support this feature within it. Limited customization options also make WooCommerce coupons a less popular choice for creating coupons in your store. If you want more than what built-in WooCommerce coupon system has to offer. Your only option is to go for extensions. There are a number of WooCommerce extensions available for helping you with the purpose. Here are a few best of them. 1. WooCommerce Smart Coupons: It is an extended version of the built-in WooCommerce coupons. With this plugin, you will be able to manage coupons with much more efficiency. Automatic bulk coupon generation, gift certificates, one-click coupon use, coupon sharing via URL’s, beautiful coupon designs, etc are the topnotch features offered by this plugin. 2. Smart Coupons for WooCommerce: This smart coupons plugin is available in both its free and premium versions. You can avail many advanced features by having this plugin in your store. It lets you configure coupons having extensive usage restrictions and checkout options, allows you to give away free products with coupons, gift coupon upon purchase, gift store credits, and for duplication of coupons, etc. It is obvious from the above article that WooCommerce coupon system may not be enough for a store that is looking forward to being a top player in the market. You will find it very hard to keep up with the competition if your online business is sticking with WooCommerce coupons. Hence, the practical solution is to go for an easily manageable, feature-rich coupon extension that helps your business grow. Hope this article was able to give you an insight into it.